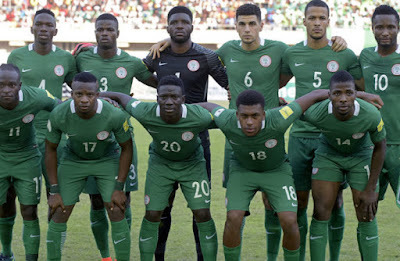 Nigeria has moved up nine places to the 41st position in the World football governing body, FIFA monthly ranking for February. Despite missing in action at the concluded Africa Cup of Nations 2017 championship in Gabon, the Gernot Rohr side are also ranked sixth on the continent. They trail Egypt, Senegal, Cameroon, Tunisia, DR Congo and Burkina Faso. The most significant changes for the February edition of the FIFA World Ranking arrive courtesy of matches played at the 2017 CAF Africa Cup of Nations. Cameroon’s victory at the tournament helped them climb 29 places into 33rd position, while Egypt’s silver-medal finish secured them a place in the Top 25. The Pharaohs (23, plus 12) are now the highest ranked CAF team. AFCON semi-finalists Burkina Faso (38, plus 15) and Ghana (45, plus 9) also enjoyed large gains while quarter-finalists Congo DR (37, plus 12), Morocco (48, plus 9) and hosts Gabon (87, plus 21) also have cause to celebrate. Despite the many successes from the Americas and Africa over the preceding weeks, the composition of the top five teams remains unchanged for the February ranking. Argentina (1), Brazil (2), Germany (3), Chile (4) and Belgium (5) hold onto their positions while France (6, plus 1) move past Colombia (7, minus 1).